After completing projects at elementary and middle schools, St. John’s Serves this year will be working at Salisbury High School. The event is set for two days, 9 am to noon on Saturday, Sept. 9, and noon-3 pm on Sunday, Sept. 10. A sub lunch will be served on Sunday. 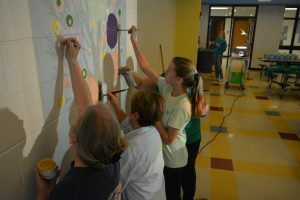 Sandra Sullivan, a teacher at Salisbury High School, says the project received $1,000 from St. John’s, plus an additional $250 from Elizabeth Derrick, who applied for a Thrivent community grant. Over two days, volunteers will landscape a student picnic area, which includes leveling the area, setting railroad ties, and mulching. 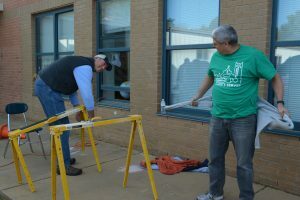 Volunteers will also paint two art rooms which have moved to a new location, plant flowers, and pack teacher gift bags. As an extra bonus, the school’s technology facilitator will be on hand to give members a tour of the technology and engineering departments. 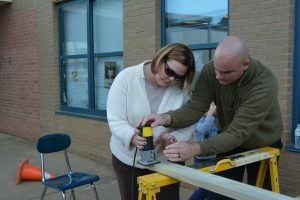 “We want our members to see what we are doing at Salisbury High School,” Sandra says. Sandra was thrilled to know that her school — she’s taught there for 28 years, spending on ly one year away with her husband’s work — was chosen for St. John’s Serves. To sign up for St. John’s Serves, visit stjohns-salisbury.org.